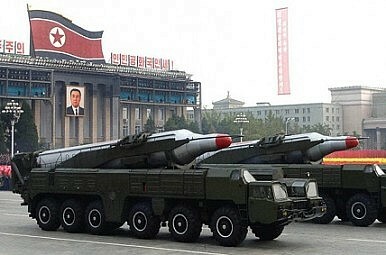 The missile in question may have been the Hwasong-10, or Musudan, intermediate-range ballistic missile. If the missile was indeed a Musudan, or Hwasong-10, Friday’s attempted test would have been the seventh this year. North Korea began a spate of Musudan testing in April 2016, with its sixth test in June 2016 demonstrating success with a reported apogee of around 1,000 kilometers and a flight distance of 400 kilometers. We also don’t know the trajectory of North Korea’s planned launch. As Hunt observes, there are really only two possibilities here that would have kept the missile out of third-country airspace in the event of a successful test. North Korea could have been going for either a lofted or regular trajectory launch into the Yellow Sea (like it has done with its satellite launch vehicle launches). Alternatively, Pyongyang could have been attempting an west-to-east overflight of North Korean territory into the Sea of Japan. In August, a North Korean Nodong intermediate-range ballistic missile splashed down in Japan’s exclusive economic zone for the first time ever, drawing a sharp reaction from Japan. Friday’s test, moreover, marked the first provocative act by North Korea since its test of an 80 ton-force rocket booster in September and, more significantly, its fifth nuclear test also that month. As usual, the attempted launch drew condemnations from the United States, South Korea, and Japan. “We strongly condemn this and North Korea’s other recent missile tests, which violate U.N. Security Council Resolutions explicitly prohibiting North Korea’s launches using ballistic missile technology,” said Cmdr. Gary Ross, a spokesperson for the U.S. Department of Defense. What's Up With North Korea's Repeated Failed Musudan Launches?